6th Year of Sharing the Magic Brings First-Ever Team Sports Moms and 19 New Panelists Lake Buena Vista, Fla., Jan. 24, 2013 – Today, Disney Parks has officially given a new name to the ever-growing Walt Disney World Moms Panel: the Disney Parks Moms Panel. Along with the change in title the company announced the … Continue reading "Walt Disney World Moms Panel Renamed Disney Parks Moms Panel"
Apply for the 6th Annual Walt Disney World Moms Panel! Disney Parks is seeking Sports Team Moms and bilingual panelists to join the 2013 panel LAKE BUENA VISTA, Fla. (Sept. 10, 2012) – Have a passion for planning unforgettable Disney vacations? Know how to organize the ultimate team sports events at Walt Disney World Resort? Disney Parks today announced the 2013 Walt Disney World Moms … Continue reading "Apply for the 6th Annual Walt Disney World Moms Panel!" Lake Buena Vista, Fla. May, 20, 2012 – Melissa Joan Hart, former star of “Sabrina, The Teenage Witch” and current co-star of “Melissa & Joey” on the ABC Family network, will join two Walt Disney World Moms panelists to discuss vacation planning during a live web chat Tuesday, May 22, at 9 p.m. ET on … Continue reading "Melissa Joan Hart to Host Live Vacation Planning Web Chat"
Actress Geena Davis Shares Beloved Disney Memories in New Moms Panel Video LAKE BUENA VISTA, Fla. (Jan. 7, 2011) – What do you get when you combine a hibachi chef, a pastor, one “mum,”ï¿½ two Canadians, two non-profit workers, four teachers, three stay-at-home moms and one special aunt with a passion for Disney and a … Continue reading "Disney Parks Welcomes 15 New Park-Savvy Panelists to Help Families Plan Magical and Memorable Vacations"
Panelists and Celebrity Moms Provide Behind-the-Scenes Look At Park Attractions and Share Favorite Travel Tips LAKE BUENA VISTA, Fla. (November 16, 2010) /PRNewswire/ – Need suggestions on how to plan an unforgettable family getaway? Look no further than the Walt Disney World Moms Panel. 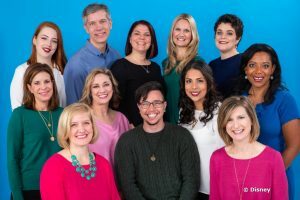 Disney’s 43 park-savvy parents have released a new set of online … Continue reading "The Walt Disney World Moms Panel and Celebrity Guests Star in New Vacation Planning Videos"
I had the pleasure of meeting the 2009 Mom’s Panel this morning. The 16 new Moms come from a variety of backgrounds and include a grandmother, a mom from Canada, one from the UK and a Disney Dad. This is the 2nd year for the Moms panel program. Everyone was excited, enthusiastic, and even a … Continue reading "Walt Disney World Mom’s Panel 2009"
LAKE BUENA VISTA, Fla. (Sept. 1, 2008) – Disney Parks today announced its search for a group of park-savvy parents to be named the 2009 Walt Disney World Moms Panel, following in the footsteps of the first-ever online Walt Disney World Moms Panel which has been fielding and answering thousands of vacation questions in 2008. … Continue reading "Calling All Walt Disney World Vacation ‘Know-It-Alls’: The Mouse Searching for 16 Parents for 2009 Moms Panel"